Not long before Christmas, I got the crazy notion that I should learn how to crochet. Honestly, I couldn’t say why. I’d learned how to knit twice in my life and I’d never really enjoyed it, giving it up both times. I’d been briefly taught how to crochet twice and never really picked it up. 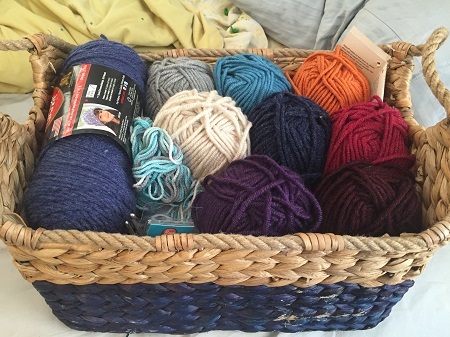 Some part of me wanted something to do with my hands, I suppose, and so I picked up some yarn and a hook. A couple youtube tutorials followed, and I made my first projects. These were simple, and I hadn’t learned any complicated stitches or how to read patterns. I’d pretty much made different kinds of squares! The new year approached, and I was unsure if I would keep going with crochet. Then an idea popped up in my FB feed and I got excited. This is (supposedly) a crocheted blanket based on temperature, one line per day of the year. If you study the picture closely, it’s really nothing of the sort, using far more colors than indicated by the gauge on the side. However, I liked the idea, and as usual for me, I decided to complicate things a bit more. Not only would I use color to represent temperature, but I would use different kinds of stitches to represent different kinds of weather, plus I’d use specific patterns (holes, ribbed lines, etc) to represent different moods. My goal was to make a blanket to represent the year, with all the bizarre artistic swirls that would be brought in with mood, weather, and temperature. Kind of like those sand-jar thingies. I decided my stitches and patterns, assigned colors to different temperature decades (different from the above “pattern”), and got to work, one line a day. The blanket is 200 stitches across, to be slightly larger than twin-sized, made for one person. However, I quickly discovered that if I did a line for every single day of the year, the blanket would end up around 16 feet long. That’s twice as long as needed! Oops! I guess this is what happens when you’re winging it, haha. My solution was to chop the year into four quarters, roughly corresponding to the seasons (starting a few days after the each new season begins). I’d crochet my lines until I reached almost two feet of blanket, then crochet in a cream-colored border to mark the end of that season. For winter, my last day of the (crochet) season was Feb 20th, so almost two months of recording. I imagine each season will vary in number of lines, depending on the height of the stitches chosen by the weather patterns. You can see, however, how volatile the last two months have been around here. We’ve had everything from highs in the 40s to highs in the 80s, five colors represented. It’s been a really hot winter around here! I’m happy with how this has turned out. And honestly, I’m glad to be taking a break from the blanket and moving on to new projects. My enthusiasm for this hobby hasn’t died out yet, and I’m excited to make a few things that are more useful than squares, and useful sooner than sometime late in the year when this blanket is finally finished! This entry was posted in Crochet and tagged I made a thing., Yarn Art. Bookmark the permalink. That is a really cool idea! I love it! I just love the blanket you are crocheting! I also love all the little squares you made because they remind me of my grandmother. She used to crochet those little potholders with the holes in them all the time and called them “Idiots delight!” Can you point me to the right youtube videos so I can learn to make them too?! This is really cool. I keep thinking I should learn to knit but I don’t think I really want to. 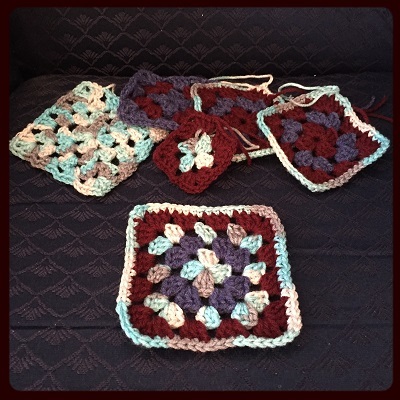 But I did crochet as a kid and have been thinking about relearning. 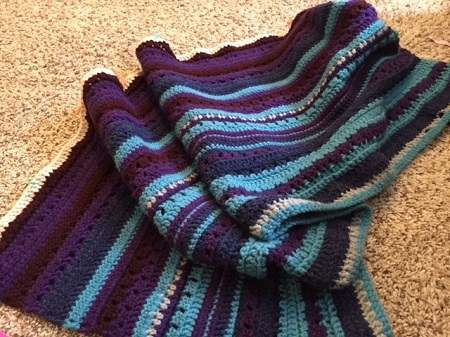 A meaningful blanket might be just the thing to get me inspired! I’ve never been able to get much into knitting. I like that the books I have on crochet have a lot of patterns for things that aren’t just hats, scarves, and socks, you know? Seems more versatile, maybe. Or maybe I just never got terribly far in knitting, heh. 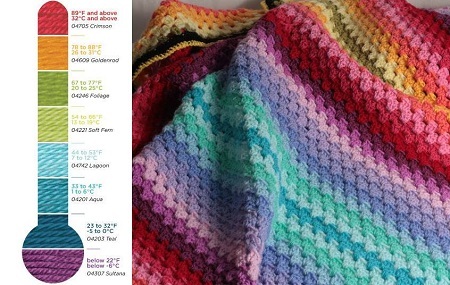 I debated doing a temperature blanket this year but opted out. I’m terrible at keeping up with crocheting! I have months where it’s all I’ll do and then other months (like this month) where I don’t feel like it at all. I would be so behind! I do love the idea though … maybe next year! 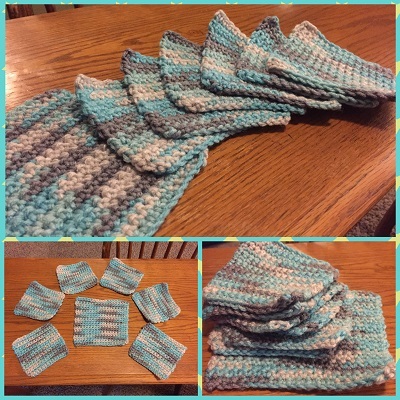 And I love crocheting so much more than knitting … it’s much more easier! I had weeks when I got behind and had to majorly catch up! I kinda like that there will be a break between seasons – gives me time to work on other things! I applaud you for your ability to knit! I’m too impatient for it, I think, haha! love love love the way that you’ve been able to take this project and make it your own! And yes–this winter. While it’s been really nice with the baby–being able to get out and go for walks/run errands without freezing, it does make me worry about this summer. Especially the bugs!! We didn’t have a single freeze this year and guessing y’all didn’t either. I look forward to seeing how your blanket progresses! What colors will you use for spring?